Dining out was still very unusual for the working classes in the 19th century. Single young men living away from home, would have eaten their midday meal in cook shops or cheap cafes such as this one. 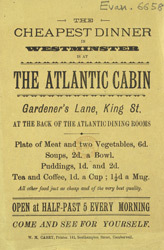 The menu was simple and limited: a pie with vegetables could be bought for only a few pence. Many of these men would have eaten a smaller meal in the evening in all-male company, probably at a tavern or cafe that provided musical entertainment.